I'm glad today starts a new week of maintenance! This past week has been a bit of a struggle for me. I was excited about doing the no-grocery-shopping challenge, but I wasn't thinking about what it would do for my eating habits. Over the past 10 months, I'd gotten used to eating whatever I wanted, which helped me to feel satisfied with smaller portions. Since we're not grocery shopping for a month, my options are limited to what we have at home (plus fresh produce). I still eat things that sound good to me, but if given the option of ANYTHING that I want, I would probably make different choices. Anyway, due to not feeling entirely satisfied, I've been eating more of other stuff to make up for it, and my "moving average weight" is creeping upward. 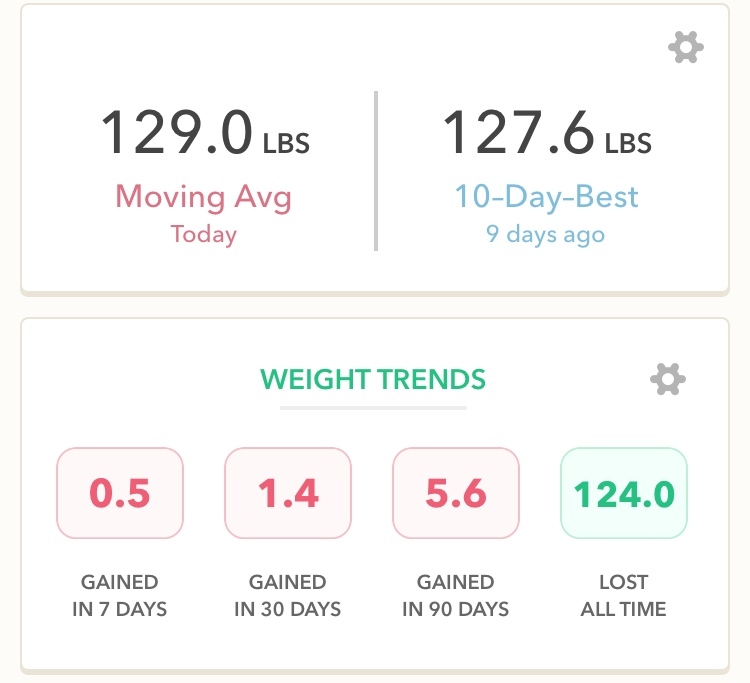 At 129, I'm still under goal, but not by much! 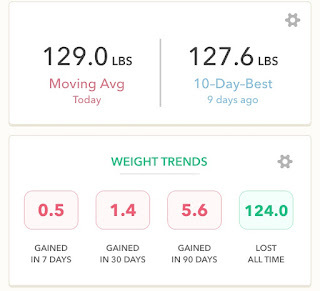 Just before I went to Portland in March, I was at 124, so a five pound gain isn't just "water weight". I'm not panicking, but I do want to be more careful not to continue to gain. I'm going to try and get extra creative with meals. I tend to feel more satisfied with my food when I'm excited to eat it, and one way of doing that is to try new recipes. So, rather than one new recipe a week, I'll try to come up with several (using the ingredients we have at home). My toughest time of day is in the afternoon--after lunch, but before my kids get home from school. By then, I've usually done what needs to be done around the house and written a blog post or responded to blog emails. It's not a lot of "free" time--maybe an hour--but it's significant enough that I want to eat when I'm not hungry. The kids' last week of school is next week, so things will change. I'll have them at home, and that will keep me super busy all day long. I started writing a list of things we can do this summer that don't involve food (which basically just turned into a list of parks that we can take Joey to run around, haha). Speaking of keeping busy with the kids, I spent about five hours on Memorial Day putting together a K'Nex set for Eli. He got it for Christmas from a relative a few years ago, but we never opened it until Monday. The box said it was for ages 9+, but looking at the instructions, I couldn't believe there was a single 9-year old on the planet that could understand them. I poured a glass of wine and got to work (wine makes the instructions easier to understand!) ;) Eli helped by sorting out all the pieces and handing them to me to put together. Finally, several hours later, we finished! It's a roller coaster that's battery operated, so it continues moving on a loop. Chandler is totally captivated by watching it. He gets as close as he can without the car bumping into him, and just stares it down for as long as we let it run. Noah really wanted to cook out on the grill for Memorial Day, which was tricky with the food we had to work with (no grocery shopping). We had turkey burgers in the freezer, but no buns; so, I ended up making homemade hamburger buns! I'd never made them before, and it was actually much easier than I thought. Yesterday was a super busy afternoon/evening, because Noah had track practice and then each of the boys had baseball practice. Since I knew things would be chaotic, I threw the stuff for French Onion Meatballs in the Crock Pot. Eli adores French Onion Meatballs--he even ate leftovers for breakfast this morning! The recipe makes 11 servings, so it's good for having leftovers. Making those made me want to make homemade French Onion Soup, so I think I'll do that soon (the only thing I'd have to buy is the onions). I'll even make homemade croutons for it. That's one of the things I actually really like about doing the no-grocery-shopping challenge--it forces me to make a lot of things from scratch. Ordinarily, I would just buy croutons or hamburger buns, but homemade stuff tastes so much better! I don't know what exactly has come over me lately, but I have been in all-out spring cleaning mode. I've cleaned and organized our closets, pantry, drawers and cupboards. I even find myself thinking, "What can I organize today?" Haha! I'm not complaining--I think this is the most organized my house has ever been--but I'm running out of projects. It's nice having so much energy, though! Have you read or heard about the Konmari method? I tried to listen to the book on a drive from SE Iowa to Minneapolis (5 hours) and I forced myself to listen to it for a good 2 hours but I just couldn't do it. I hear the book itself is better. I'm more of a reader than listener. I wish I could find "joy" in reading about it. I'm reading the book now and it's great and the urge to purge has already kicked in and my sock drawer is so tidy hahah! I re-organized my tool box even! I've never done it before but I think allrecipes.com has an option where you type in what ingredients you have and it links you to different recipes you can make with it. You're within your desired range so you're still doing really well, but definitely a good thing with all the trends up to switch things up. That weight gain can be a really quiet thing that sneaks up on you!! Maintaining is really hard! I hit my goal weight for my wedding last year and then almost immediately re-gained and then some. It was pretty crazy, but I think my hormones became completely out of whack. Even though I tried to get a grip when my weight started creeping up, I just couldn't! I'm finally starting to get a handle on it again, but the struggle is real!